Part murder mystery, part historical novel, part spiritual meditation, part political intrigue, part love story, part philosophical treatise, part artistic rumination, part narrative experiment. . . .
Orhan Pakmuk‘s My Name is Red, the English translation of which helped him secure a nomination for the Nobel Prize in Literature (he won in 2006), is many, many things. And in most other books, this would wind up becoming a jumbled mess, a confusing genre mash-up that would trip over itself trying to sell too many things to too many readers at once. But Pamuk handles the story brilliantly. Brilliant. That’s a word that gets used perhaps too often, certainly by me. So let me take a breath and type it again, slowly and deliberately. My Name is Red is a brilliant novel. 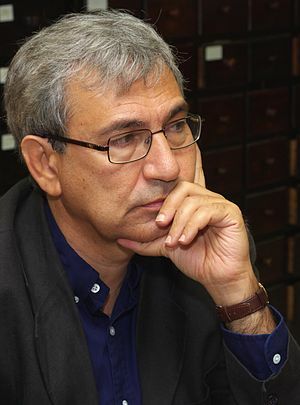 I can’t say much about Pamuk’s translated prose because I have no idea how the novel reads in Turkish (though translator Erdağ M. Göknar‘s sentences are wonderful to read — in almost every sentence he manages to strike a perfect balance between artistic flourish and reader-friendly directness), but the structure of the story and the way Pamuk unveils his characters — their backstories, their yearnings and fears and obsessions and schemes — one chapter at a time, through their own voices, the voices of others interacting with them or thinking about them, sometimes even the voices of inanimate avatars like a coin or a drawing of a horse or the color red: it’s simply astounding. This book is dense and complex, and it took me a bit of time to get into; I confess I might have given up on it after a few chapters if not for two very personal attractions: the novel opens with a dead narrator (my doctoral dissertation’s scholarship is on postmortal fiction), and the setting is 16th century Istanbul, so a lot of the buildings and characters and historical information reminded me of my trip to Turkey about 14 years ago. Other people might get frustrated with this novel before they have time to become absorbed in it. But read on. Read it again. Spend a long evening reading your way into the book, and then dream about it at night. It’s worth the effort. Pamuk rewards you.